This fragment, representing the head and upper body of Osiris, probably formed part of a standing statue of the deity. The god is dressed in the usual enveloping and close-fitting robe, and holds his arms crossed on his chest; in his fists are the symbols of kingship, the crook and the flail. On his chin is the conventional divine beard, the end of which is broken off. 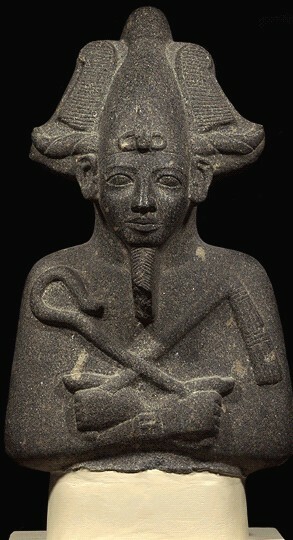 He wears the atef crown, which resembled the white crown of Upper Egypt, with a feather on both sides, and a pair of ram's horns jutting out at the base. In artistic depictions this crown is most frequently worn by Osiris, although it can be shown with other gods and appears on the head of the king at times; its associations are with rebirth and renewal.